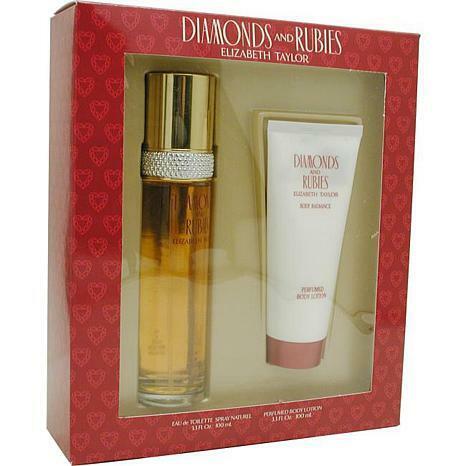 Launched by the design house of Elizabeth Taylor in 1993, Diamonds & Rubies EDT Spray 3.3 oz & Body Lotion 3.3 oz is a womens fragrance that possesses a blend of Lily, Red rose, Almond wood, Peach, Lilac Diamonds & Rubies is recommended for evening use. This item may not ship to Alaska, Guam, Hawaii, Puerto Rico, or the Virgin Islands using a ground shipping method. Please select an air method when ordering this item for those locations. All Orders must also have a physical address and not a P.O. Box. Bought for my mother and I get her a big bottle every year for Christmas. Its her favorite. White Diamonds always wonderful scent and so nice have used for years. What a wonderful scent if you're a sweet scent typye of woman. Very nice for the Spring.